George Graham Reviews Liondsay Mac's "Stop Thinking"
The ranks of singer-songwriters are bountiful, with hundreds on the music scene doing very good work. There's so much worthy talent out there that the standard seems to be rising all the time. So setting oneself apart in a crowded field is not easy. One way is to have a distinctive sound, especially if one uses an instrument other than the acoustic guitar. There are, of course, the piano-playing singer-songwriters, and this series has featured singer-songwriters whose instruments are the concert harp and the trumpet. This week, we have a fine new release from a composer-vocalist whose instrument is the cello. 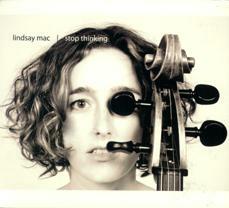 It's Lindsay Mac, and her new second CD is called Stop Thinking. Having a cello around is not exactly new in the singer-songwriter field. Earlier this year, we reviewed a recording by Ben Sollee, who is also a cellist. The duo Bethany and Rufus consists of a vocalist and cellist. The band Crooked Still features a cello prominently, and going back almost three decades, the late Harry Chapin would often feature a cellist prominently in his group. Lindsay Mac brings her own distinctive approach -- and at this point, playing a cello as a front person is automatically distinctive -- she straps on her cello like a guitar and as often as not, strums and plucks her instrument. Lindsay Mac has an interesting background that led her to her style. Born in Iowa, to what are described as "Bohemian, party-hungry parents" she started in music through a church choir, then began formal classical training on cello and piano, and while in high school, attended the Interlochen Center for the Arts during the summer. But she enrolled in Dartmouth College to study medicine. Dartmouth offered students an opportunity to study abroad, so she went to England and studied at the Royal College of Music. She also spent time at the San Francisco Conservatory, and took some time out to be a professional ski patroller in Utah. She eventually returned to Dartmouth to graduate. She lived for a time in a rustic cabin and began to concentrate on her music and developing a style. She then went on to attend the Berklee College of Music in Boston, and launched a full-time career as a touring musician. She released her debut album called Small Revolution, in 2005, which was a fascinating blend of literate lyrics, personable vocals and the distinctive sound of the cello, an instrument which, in the proper hands, be both interesting and appealing. Now Ms. Mac is out with Stop Thinking and it's a bit of a gem, with fine songwriting, irrespective of the instrumentation, pleasing vocals, and an interesting blend of the contemporary in the manner of people like Ani DiFranco, with the more traditional folk-influenced aspects of the singer-songwriter scene. The arrangements on the new CD branch out and are more interesting. She is joined on Stop Thinking by a small band, including Jason Petrin on bass and drum machine, and Stephen Webber, a multi-instrumentalist who plays guitars, mandolin and banjo. There are also some added musicians such as reed player Scott Shelter and a string section with violins and more cellos, including cellist extraordinaire Eugene Friesen. Singer-songwriter cellist Lindsay Mac's new second album Stop Thinking is charming, engaging, sonically interesting and lyrically first-rate. One can't ask for much better in a singer-songwriter album, irrespective of the instrument played by the artist. The fact that Ms. Mac plays cello and uses it in a distinctive manner -- in many cases as a folkie would use a guitar -- makes the recording all the more intriguing. For sound quality, we'll give this CD one of our increasingly infrequent "grade A" scores. Both Ms. Mac's vocal and her cello are nicely recorded, and the CD a decent dynamic range, something becoming increasingly rare. The recording was not compressed much, so there is a nice ebb and flow. I might quibble with the lo-fi approach taken on her version of Blackbird, but overall the CD does well by a good sound system. With so many singer-songwriters competing for attention, it's often difficult for one to find a compelling reason to pick one good artist over another. Lindsay Mac brings much to the musical table, and her new CD is definitely a standout.